Magnus Carlsen has won the 7th London Chess Classic, and with it secured victory in the inaugural Grand Chess Tour to boot. Half a point behind the leaders, (Anish Giri and Maxime Vachier-Lagrave), the World Champion knew that he had it all to do on the final day of play. Only a final round win against Alexander Grischuk would see him in with a chance. At least he had the White pieces, could he make them pay? Their game actually followed Carlsen’s game against Topalov in this year’s Sinquefield Cup in Saint Louis. That game was won by Topalov, and one would have to assume that Grischuk felt fairly comortable also. Carlsen was the first to blink, varying with 10.Nc3 instead of the 10.Na3 that he’d played against Topalov. The new move does seem to be more pleasing on the eye, would it be pleasing on the scoreboard also? Well, yes, as it would turn out. After 10.Nc3, perhaps Grischuk chose to continue with the wrong rook, playing 10…Rb8. It turned out to be a bit too quiet. Maybe 10…Rg8 would have been more challenging to White, but this rules out castling in effect, so it’s a very non-human move to play unless heavily prepared. Also, White has the possibility of playing 11.d4 and if Grischuk had not looked at this position earlier, then it would be unwise to get in to it now, especially with his time issues as of late. (Just out of interest, it seems that exchanging on d4 is ok for Black, rather than taking en-passant on d3, which seems a tad better for White.) Anyway, these are possible explanations as to why the Russian chose the slightly less complicated continuation. However, this continuation did not really seem to test his opponent very much, and when Black decided to go for 13…Nxb2, there followed a rather natural sequence of moves that just seemed to turn out rosy for White and after exchanging a set of rooks, Carlsen was very much the better. That, of course, is like a red rag to a bull, and he pushed. All seemed to be going swimmingly, but perhaps Magnus got a little too excited with 27.Rf3 and 28.Nb5, when after the more patient 27.Ne2, Black’s position is unpleasant and White’s is very flexible and threatens to explode like a coiled spring. As it was, after 28…Be5, White’s advantage had evaporated, and the position was pretty equal. There followed 29.Ng4 Qh4 30.fxe6 fxe6 31.Nxe5 dxe5 32.Qxe6 and I would be interested to know what Carlsen intended after 32…Qg5, when it seems that 33.Rf2 or 33.g4 would give a position that is hardly here nor there. However, we will never know, as Grischuk thought that he had perpetual and went for 32.Qe1+?? which lost. And so, job #1 of the day done for Magnus Carlsen, it was now a case of seeing how Giri and Vachier-Lagrave did. 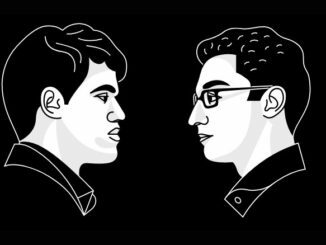 No disrespect to Anish Giri, but he was always going to have a tough job getting a full point from Vishy Anand as Black. And when the game took the form of the Berlin Defence, hopes were not high to be honest. It was largely theory, and infact up to move 27 followed a game that Anand had played against Carlsen, in their 2014 World Championship, but with colours reversed. Anand’s 27.Ng2 deviated from Motylev-Belyakov, from this year’s Russian blitz Championship and we were in new territory. From here, the players mooched around for a few moves and repeated — not really a very eventful game at all. 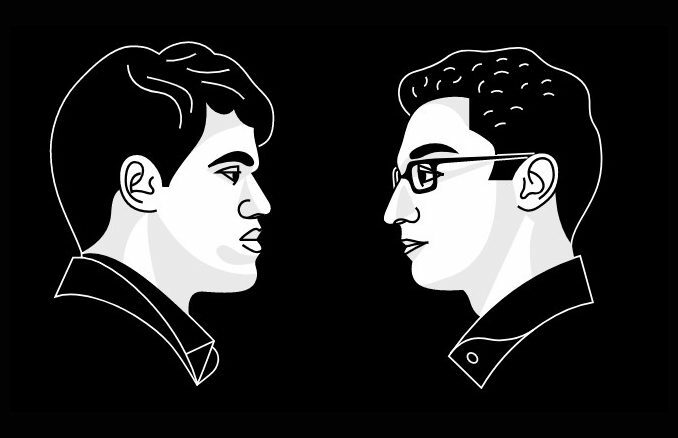 It could be said, perhaps, that Maxime Vachier-Lagrave didn’t choose the best opening as Black against Levon Aronian — namely, the Symmetrical English. He actually didn’t do too badly with his opening, though, and he was aided a little by ‘quiet’ play by his opponent. When the queens came off on move 8, signs of a fight were already fading, in my opinion, and further liquidations quickly dissolved any tension possibilities. A draw seemed the only result, and that was agreed on move 33. All this, then, left a 3-way tie at the top, between Magnus Carlsen, Anish Giri, and Maxime Vachier-Lagrave. All had scored 5.5/9, but Carlsen had the better tie-break score, and so shot his way straight to the final. Giri and Vachier-Lagrave were left to battle it out for the right to face him. There has been some criticism of this format, playing the final round, plus all tie-breaks on the same day. In the event of a 3-way tie, such as this, one player (Carlsen in this case) gets straight to the final, while his future opponent will potentially play 3 extra games — 2 rapid and one armageddon, sudden-death, decider, if needed. As unpleasant as this is, things have to be decided somehow, and all players know what they are getting in to. It’s a bit like penalties in football, a necessary evil, that nobody likes, but everyone accepts is there lurking. And the armageddon game was needed, as Giri and Vachier-Lagrave shared their rapid games. Giri will possibly kick himself a bit for letting Vachier-Lagrave off the hook slightly in the second game, when the Dutchman only needed to draw to go through. Playing the Black side of a Grunfeld, Giri neutralised White very well, and it was looking like Vachier-Lagrave was not going to be able to generate any play. This changed later in the endgame, and Vachier-Lagrave took his chance to equalise. For the Armageddon game, Giri drew White, and so would receive 6 minutes to Vachier-Lagrave’s 5, but have to win. The Reti opening didn’t really work out for Giri, Vachier-Lagrave is a super blitz player and dominated the game to take the full point rather than settling for the draw he needed to go through. And so, a final showdown with Magnus Carlsen awaited. Carlsen went for it in game 1 of his tie-break against Vachier-Lagrave, playing White in a Moscow Sicilian. Clearly, with the opponent having just come through an armageddon decider, one would want to play something meaty. This being said, although the World Champion was better throughout the game, the Frenchman did not let him run away with it and hung in there. In the endgame, there was a little hope that Black could hold for a draw, but perhaps tiredness had begun to set in, and some slips let Magnus convert the point. Being honest, considering that Maxime Vachier-Lagrave had to win the second game in order to force a decider, I don’t think he made the best choice in yet another symmetrical English. I think that perhaps fatigue had a lot to do with it, and maybe he didn’t have a lot left — understandably so. Carlsen turned things around quite smoothly as Black, and soon held the advantage. By move 30, his opponent’s game was largely demolished, but rather than push for the full point, Carlsen settled for the draw he needed to win the tournament. This left Magnus Carlsen with the trophy and winners purse of $75,000 (£49,455). In a rather strange twist, Anish Giri would finish in second place, and Maxime Vachier-Lagrave third. I am not quite sure how a player can be a losing finalist but finish third, I have to say. I assume tie-break scores. This is fair enough, (I guess? ), but then why not just decide things like that in the first place? It seems to make the tie-breaks and armageddon finish rather irrelevant and a mute point. Not to mention, the fact that if Vachier-Lagrave had beat Carlsen he would have won the tournament, yet having defeated Giri, (in order to have the right to play Carlsen for possible victory), he is suddenly third, strikes as a little …. silly? Oh well, far be it for me to ever question the sense and logic of the chess tournament organiser. 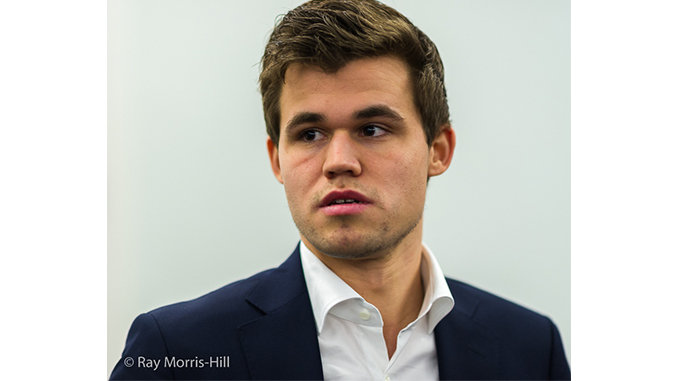 Winning in London also meant that Carlsen took victory in the inaugural edition of the Grand Chess Tour. This combines the Norway Chess Tournament, Sinquefield Cup, and London Chess Classic. Participation was by invitation. Players would be awarded points based on their results at each tournament, (13-points for an outright win, 12-points for a win by play-off, 10-points for 2nd, 8-points for 3rd, then 7, 6, 5, 4, 3, 2, 1), and these would accumulate over the course of the tour. With a total prize fund of over $1,000,000 (£660,200), there would be $300,000 (£198,060) on offer for each event, as well as $150,000 (£99,030) split between the top three placed for the tour overal. The winner would receive $75,000, 2nd place $50,000 (£33,010) and 3rd place $25,000 (£16,505). Despite beginning the tour terribly and scoring only 3½ points in Norway, where he finished joint 7th, Carlsen recovered some form to finish second (behind Aronian) in the Sinquefield Cup. This, coupled with the fact that Norway winner, Veselin Topalov, didn’t do too great at Sinquefield, meant that Carlsen was now right back in the hunt. Everything was all to play for in London. Luckily for Carlsen, when it came to his rivals in the Grand Tour, only Aronian threw himself into the mix in London. And while Carlsen, Giri, and Vachier-Lagrave went into tie-breaks, Aronian missed the cut by a half point. With Aronian in 4th, and his Grand Tour points established as 22-points over all, Carlsen could win the tour with a second or higher finish in London. Of course, you don’t get to be a World Champion by being content with second place, and he went on to go one better.